At some point last fall, Coach Gerry got it into his mind to train us for swim meet. Not even a whole meet, actually, but one particular event––the 200m Butterfly. As we were told repeatedly over the course of the next few weeks, the 200 Fly and the 400 IM are considered some of the toughest events of any swim meet. So of course we had to try it, right? Quick recap––I don’t have a swim background. I learned how to make it across the pool at the ripe old age of 23, with drastic improvements made under Coach Gerry’s tutelage. Most of the members of our group had similar swim histories. Some did know how to swim butterfly (and did so very well) but most dreaded it. So Coach Gerry taught us how to fly. Awkward, babbling sets of 25 yards mixed into longer stretches. Torturous lengths of butterfly with tired arms and burning legs. There are a lot of things in swimming that I’m bad at (kick sets or anything resembling kick sets) and there are a few things that I’m okay at. For whatever reason, butterfly is a stroke that I’m actually pretty good at. Like, weirdly good. Like, better than freestyle good. I’m not necessarily fast by any sort of competitive standards, but I can hold my own with it for longer than most people on the team. It’s comforting to think that we all have awkward body proportions and muscle arrangements to the extent that there’s at least one specific stroke for all of us. And I found mine. Our strict instructions from Coach Gerry were not to overly exert ourselves for any reason. 200 meters (not yards, but meters) meant eight lengths of the pool, by definition, 8 times what we were used to swimming when we did our short butterfly sets. We could rest on the wall if necessary, but the goal was to make it through the race without being disqualified (high standards, I know). As such (and with my vicious history of blowing up) I took him at his word. 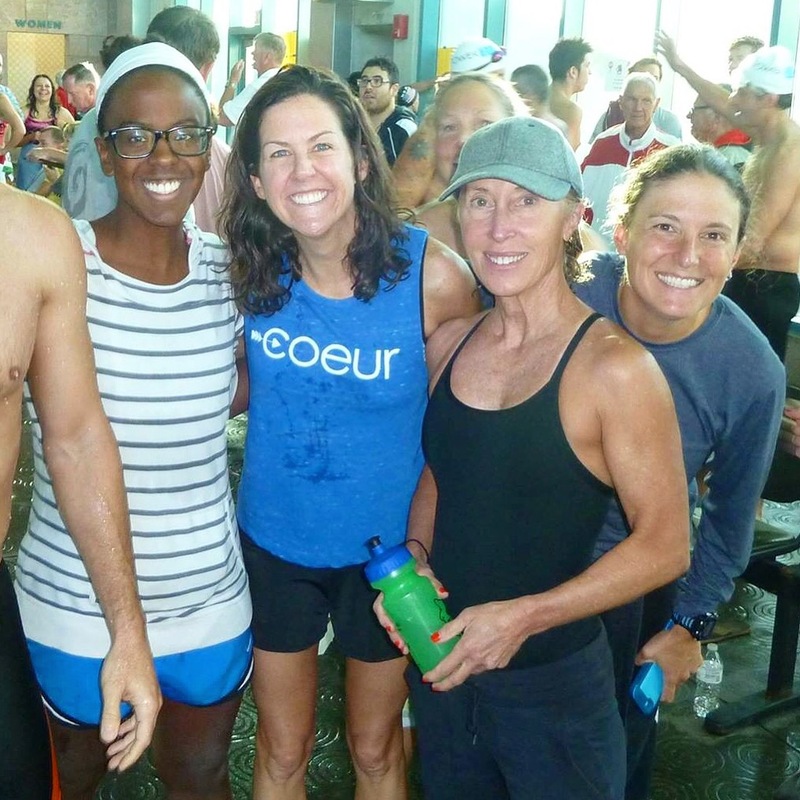 On the morning of the swim meet we met in the foyer of the aquatic center, all of us overdressed and awkwardly dry, unfamiliar with swim meet protocol. Gerry delivered an inspirational, emphatic speech and then we all drifted to the warm up pool. Less than wisely, I took a detour back to the locker area and next thing I knew, our event was up. I hurried back down to the warm up pool. Swam 3 awful, lukewarm, high chlorine laps to “warm up” and then slogged my way back to the starting deck. I shoved down the mushy end of a banana while I watched the heat before mine paddle their way through their eight laps and finish, battered and exhausted. We had the option of diving from the blocks or starting in the water and I planned on taking no chances on the blocks. Last thing I needed was for my goggles to pop off during my first swim meet (hats off to the little kids who dive in fearlessly). I slipped into the water to await the start. The whistle blew and I was off. I felt a weird, strange sort of calm for the entirety of the swim, focusing on the soft scoop and pull of my stroke, breathing in a balanced rhythm, counting down the lengths until I was done. During the last 50 meters I decided to push just a little but then settled back into my normal speed. As nervous as I was, I was comfortable! It was the most calming feeling of zen that I’ve ever felt (despite my anxiety), and one that I hope to be able to recapture in future events. Finally, the race was done. The most anticipated event I’ve ever done and at the same time, the shortest race of my life. I crawled back onto the deck to watch my teammates in the other heats and was surprised to see how (relatively) well I had done, even compared to the men who swam several lanes above me. None of us took the podium (a strange occurrence among our crew), but we were all better for the experience.